Join the discussion on our forums! Come discuss Blightnozzle Crawler over in our dedicated Blightnozzle Crawler discussion topic. 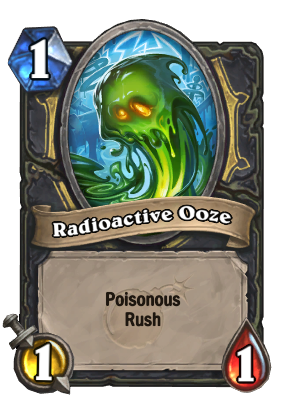 I just played against a rogue deck that was able to resummon the radioactive ooze like an echo over and over. Wiped out my 7 treants from Spreading Plague twice. How does one make that happen? Underrated card.. Been playing deathrattle rogue since release.. So many ppl have no clue how to handle this one which leads to some very weird spots for the opponent. A great card in the right deck. i've been play testing this in a tempo deck with Carnivorous Cube and Necrium Blade. it's strange to say this, but "you can't compare this card with Vilespine Slayer ". Vilespine Slayer is definitely a better card, you can put it in nearly any deck that contains cheap combo enablers, while Blightnozzle Crawler can only be put in decks that can get benefit from "milking" the deathrattle. 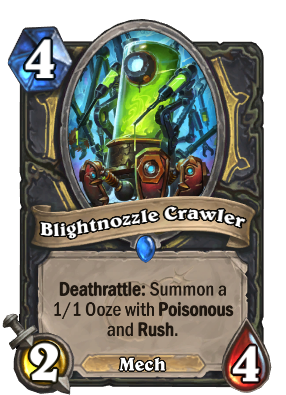 Blightnozzle Crawler is a more proactive card than Vilespine Slayer, you can slap it on the board in turn 4 without feeling bad, since it will create a strange scenario for your opponent: if he can't clean the token, he will probably let the 2/4 live, making a free body for Carnivorous Cube; if he can clean the token, he will probably waste a turn doing so. i like this card, certainly one of my favorites, but it needs more support. Turn four last swing with Necrium Blade makes this an early removal. The reveal of Necrium Blade has really changed the value proposition of Blightnozzle Crawler. It comes down on curve right as you're ready to destroy your blade and trigger its deathrattle, getting a lot of tempo value at least one turn before Vilespine Slayer comes down. Wasp does a similar and better job and sees no play. Deathrattle rogue is still not a thing. No one has mentioned how crazy the token would be with Sonya. It needs to be said. It’s a board wipe plus an extra assassinate in your hand for later. And if they couldn’t kill Sonya... oh boy. The token is just crazy good. At face value this seems kinda unimpressive, but I think the "secret" to this card is finding a way to reliably pop the deathrattle and then Lab Recruiter the token. Radioactive Ooze and Elven Minstrel approves of this. If your opponent has at least a little removal the deathrattle isn't too scary. Still, this could be useful and seems playable. Love the art but it does seem to weak with 2/4. 3/3 would've made it much better. Just think of the possibilities. Turn 6 play this and then Eviscerate it. You pretty much get to kill any one minion for 6 mana and 2 cards. Rogue has been waiting for removal like this since never. I was about to downvote until I saw the last sentence. I guess you can Carnivorous Cube it to kill one guy and create a 4/6 that should not be killed and demands silence or maybe Lord Godfrey. But kinda meh. A 9 mana combo that kills a guy creates a very sticky 4/6 but vulnerable to silence. this would be a lot better if the crawler itself had rush, and if Assassinate didn't exist.